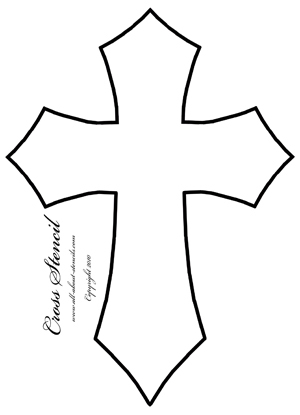 These cross stencil designs offer you a nice variety for all of your religious arts and crafts. Like most saints, there is no single specific cross associated with St. Nicholas Of course in his case, we hear more of Santa Claus than Saint Nicholas himself or his cross. Even so, he is one of the most popular saints, especially for Eastern Catholics and the Orthodox. Due to his charity and concern for the welfare of children, the Archbishop Nicholas (280-342 A.D.) of the Mediterranean port of Myra (Turkey) became Saint Nicholas and is the patron Saint of children and travelers. Are you new to working with paper stencils? If so you should know that you can prepare your paper stencils so that they can be used again and again. Yeah! That’s right. The cross stencil you just printed can become a long term free stencil. It’s easy. Get a roll of clear shelf/drawer liner. Cut sections the size of your stencil, peel off the back and cover the entire top side of the stencil. Burnish or rub down to get the air pockets out. That’s it. Working with paper stencils like these cross stencil designs have a few advantages like being able to make the same stencil different sizes. You can also take the page to a copier machine to reduce or enlarge to fit your project size. 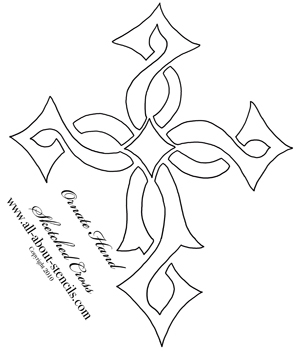 This is an ornate cross stencil that I hand sketched for card making. It’s easy to make lovely cards with this stencil, just trace it onto a sheet of fine paper (I like to use a cream colored thick stock), and cut out the openings (island). Fold the paper in two and and glue a different color paper to the inside just along the back side of the fold. When you close the card, the openings will reveal the colored paper. 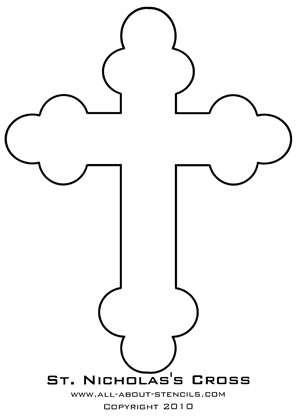 An ornamented standing stone cross, often with a circle, is called a High Cross. There are various other names, including Iona Cross, Scottish Cross, Irish Cross, Welsh Cross, Anglican Cross, St. John’s Cross and Halo Cross, etc. The cross arms may extend beyond the circle or terminate at the circle, in which case it would be referred to as a Disc Cross. In Germany and the Netherlands, it is called the Keltisch Cross and in various countries it is known as the Gaelic Cross. The design is popular in Ukraine and adorns the tops of cupolas, where the circle sometimes has rays emanating out, much like a Sun symbol. 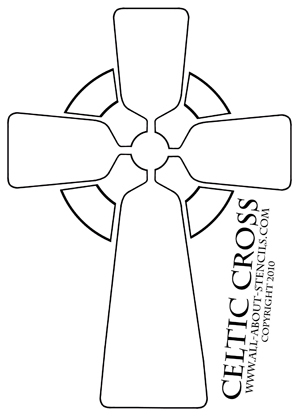 Anglicans and Episcopalians usually call this the Anglican Cross, Episcopal Cross or Celtic Cross, whereas Catholics often refer to it as the Irish Cross. But just as the Protestant Christ is the same as the Catholic Christ is the same as the Lutheran Christ, all these crosses are one and the same. By the way, these cross stencil designs are part of our Free Stencils Collection. We have so many to offer that they are scattered throughout this web site so keep browsing the pages and come back here for all your Stenciling Ideas. Hey! Don’t forget that I (and everyone else) want to see what you have done with your cross stencils. Just click on Stenciling Projects to get your masterpiece showcased here on this web site. Won’t that be exciting! Or if you have any questions or want to share information join in on the Stencil Blog. Well, I hope to hear from you soon. Return to Home Page from Cross Stencil Designs. Return to Free Stencils from Cross Stencil Designs.